Part 3 has arrived! Get ready to feast your optics on 5 more totally awesome pieces of camping equipment. Before you hit the backwoods for another outdoor adventure, checkout these 5 brand spanking new camping gear inventions that may tickle your fancy. Enjoy the video! Learn even more about this super cool camping equipment by visiting the websites below. 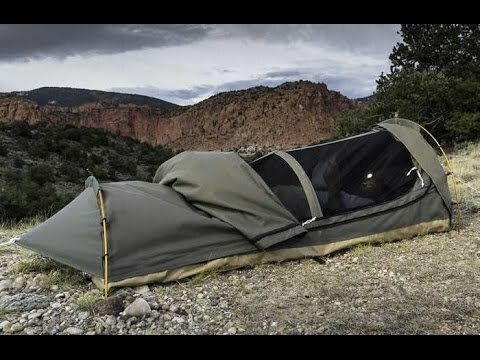 0:07 - Kodiak Canvas Swag Tent - http://www.kodiakcanvas.com/swag-1-pe... - Ultra versatile one-person tent that can be pitched on the ground, in the bed of a truck, or even mounted on a compatible cot. 2:20 - Velocity Grill - https://www.velocitygrill.com/ - Incredibly effective wood fired camping grill that can heat up to 1,000 degrees in minutes on just 2 small pieces of wood. 4:48 - SOS Balloon - https://www.facebook.com/RescueMeBall... - The ultimate solution for identifying your location. Lost at sea or in the wild The SOS balloon serves as a rescue beacon, plus a great base camp indicator. 7:22 - Pure2Go - http://pure2gopurifier.com/ - A highly advanced hand-held water purification gadget that kills bacteria, viruses and cysts. Camping can go south in a hurry, having access to clean drinking water is essential. 10:48 - MacroBoom - http://www.roamproof.com/ - Love the great outdoors, but don't wanna leave your tunes behind The MacroBoom is slated to be the most rugged solar-powered Bluetooth speaker available. A must have piece of camping gear! Featuring the latest futuristic inventions, cool gadgets and other awesome technological advancements that you may or may not have already heard about. Thanks for watching! Until next time... Look to the Future! * Prices featured in the video are reflective of the date published. 10 SMART İDEAS - Watermelon Tricks! "WALKCAR" car in a bag | COCOA MOTORS.Inc. Clamp Invention - This time it is Perfect!